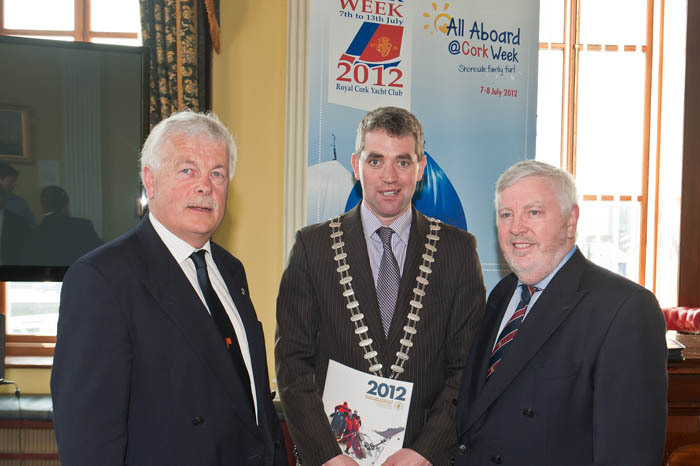 The Launch of Cork Week 2012, Europe’s biggest regatta organised by a single club, were announced yesterday [WEDNESDAY 28th MARCH] at an event in Cork Harbour Commissioners. Held on a biennial basis at the Royal Cork Yacht Club in Crosshaven, Co. Cork, Cork Week is a Grand Prix sailing event and is renowned, worldwide, for exciting and challenging racing. Cork Week 2012, which takes place from July 7th to 13th, primarily attracts sailors for the quality of its sailing. Boats from all over the world are expected, and this year, entries have already been received from as far away as South Africa and Hong Kong and it promises to be one of the most competitive events yet with the relaxation of the professional sailor rule. Cork Week 2012 will also host the J109 Irish National Championships following the very successful European Championship at Cork Week 2010. However, in addition to top class racing, the fabled on-shore tented village lets all crews interact socially in a fun way which has become one of the main ingredients in the success of Cork Week. The centrepiece of this year’s entertainment line up is “Bodega by the Sea” – which sees Cork’s Club Bodega setting sail down river, bringing with it a motley crew of Ireland’s biggest Bands & DJs. Cork Week will see acts such as Soul Driven, Pontius Pilate & the Naildrivers, The Papa Zittas, Death By Chocolate and some of the country’s best-known DJs. Cork Week 2012 is proudly supported by Cork’s 96FM and the Irish Examiner.